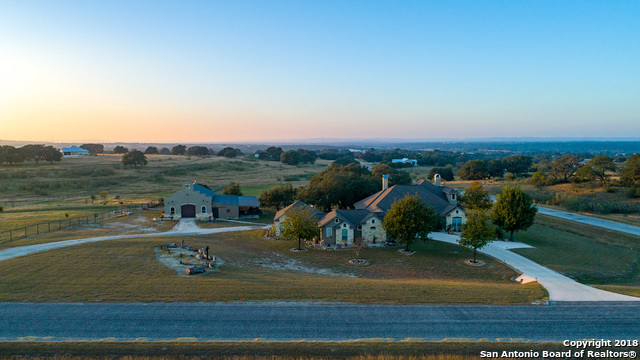 All Bandera homes currently listed for sale in Bandera as of 04/22/2019 are shown below. You can change the search criteria at any time by pressing the 'Change Search' button below. 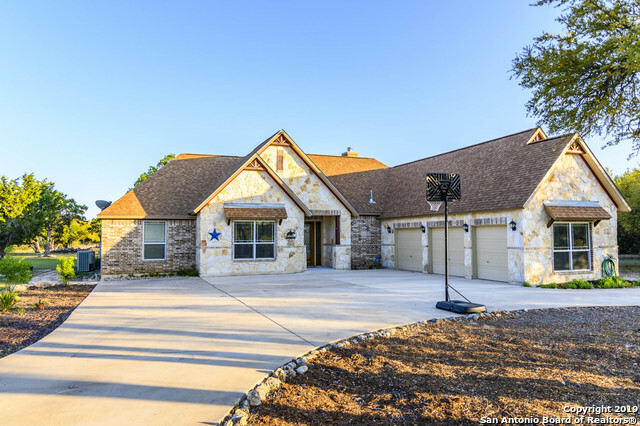 If you have any questions or you would like more information about any Bandera homes for sale or other Bandera real estate, please contact us and one of our knowledgeable Bandera REALTORS® would be pleased to assist you. "Country living at it's finest! 60 Acre high fenced ranch overlooking private lake, Rock Cliff Reservoir. Level & usable land perfect for cattle, horses, or runway. Large warehouse for equipment, storage, extra housing. Horse stalls & chicken coop on property. Approximately 800 sqft guest home not included in sqft. Main house has 4 bdrms, large living room, open kitchen, & wrap around screened porch. Great fishing on private pier & boat ramp. 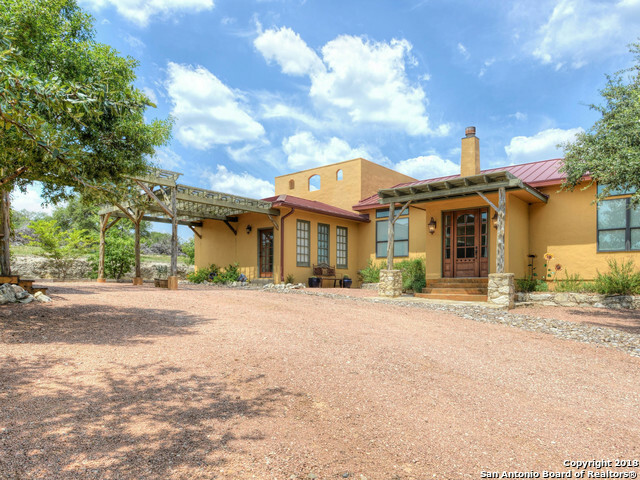 Perfectly situated for great breezes & dodging the aft"
"Hill Country Hacienda-Custom designed, hand troweled stucco one story home plus 1020 sq.ft guest house. Home has plaster walls, windows galore to view the hills, Spacious great room with interior cedar logs separating areas within the great room for the dining and breakfast areas, sunny and colorful interior accented with art niches, Wildlife Exemption, GUEST/ARTIST STUDIO SEPARATE. 55 ACRES, BEAUTIFUL VIEWS!" 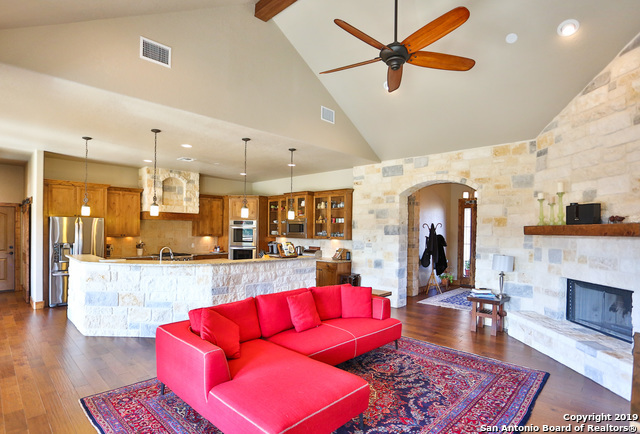 "Stunning luxury home on 6 acres in prestigious Bridlegate just minutes from Bandera and a short drive to San Antonio and Boerne. 5 bedrooms*4.5 baths*2 fireplaces*high ceilings*hardwood and tile floors*granite countertops*custom cabinets*walk-in pantry*workshop*horses stalls*cross fenced top rail no climb fencing*2 car garage*1 car garage w/HVAC*1,500 sq ft finished out barn for entertaining/storage etc. 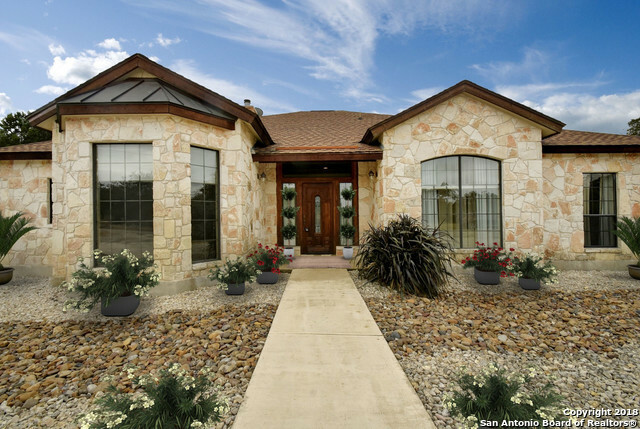 HOA amenities: bridle path, Medina River park, pools, fitness center, sport courts." "Wonderful open floor on 6.71 acres in the beautiful Bridlegate subdivision. Large kitchen with granite counters, custom cabinets, gas cooktop with tons of counter space,open to family room,dining room plus mostly glass back for great views.Large master,master bath with double vanity, large walk-in shower, dressing area and walk-in closet. Outdoor kitchen and covered patio. Amenities:2 clubhouses,2 pools,bridle paths and river front." 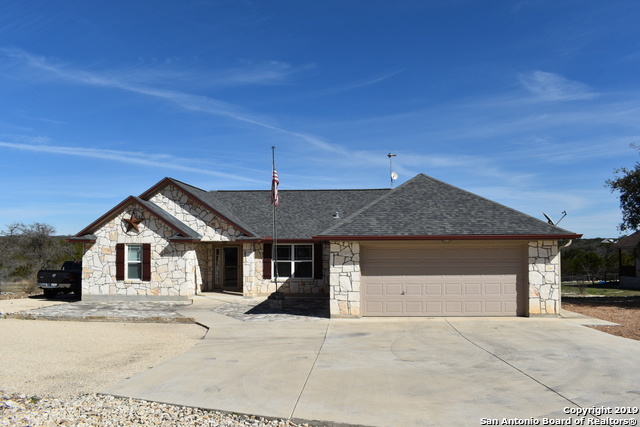 "Stunning 100% rock limestone home in Montague Ranch Estates. No HOA dues. large 3 bedroom 2 bath, formal dining area, 2 family rooms, master split, step down into the living area with fireplace & heatalator, large office/ study, large covered back patio with BBQ grill. Circular driveway, beautiful mature oaks, land is mostly cleared BCAD sq. ft is incorrect. Just a few miles north of Bandera. Great location to raise a family in the small subdivision of Montague Ranch Estates." "This listing is to show what could be built on the lot. See MLS 1339012 for property that is for sale. Builder has provided elevations and floor plans to assist you with ideas to build your Forever Home." "4.68 Acres approx 1000 ft of HWY 173N frontage. 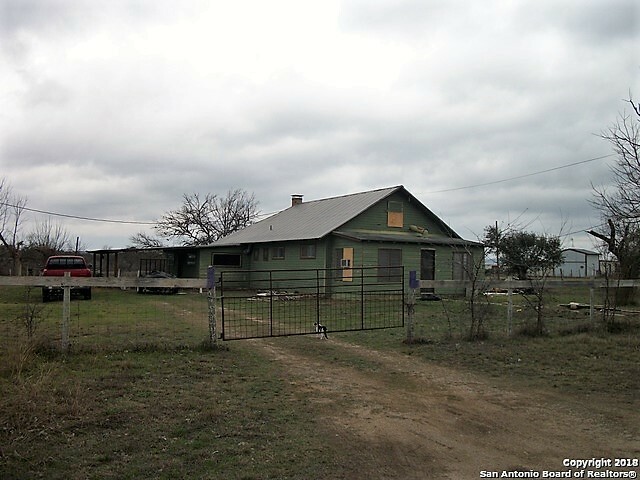 Old Homestead, 3bed, 2000 sqft, w/covered porch, 3bed, 2 wells, fenced and 60 unit storage units. Live in the home and add additional storage units the possibilities are endless! Residential, commercial or both!" "income producing 5 rental units, live in one and rent out the rest. 5 cabins furnished and 10 - 50 amp RV sites. City water, private septic tanks. Paved drive way, mature trees scattered for good shade, private covered patios. On site coin operated laundry facility for the tenants. 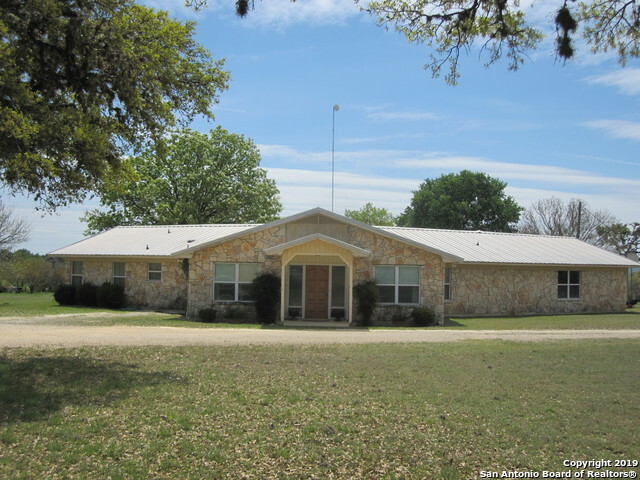 This is a must see if you are looking for a great rental property less than 1 mile to the city of Bandera." "Amazing 3 bed and a His/Her Bathroom, Plus 2 half bathrooms. 10' ceilings, Large kitchen open to living room. Many details for modifications were built in ie: doors/dishwasher. Amazing back porch to enjoy summer or winter, Hot/Cold Water outside, His and a Her LARGE workshop's, both a dream come true, AND extra large garage, and carport, and lean-to, and barn. All buildings were built to the highest standards. Circle Drive, aprox 20 minutes to Kerrville, 10 to Bandera. 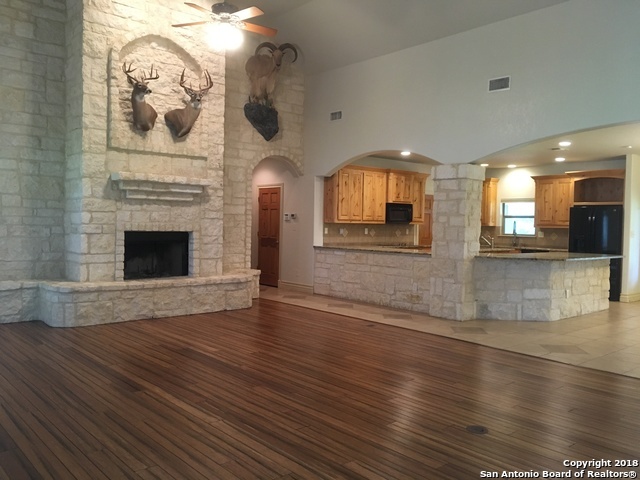 unrestricted property, ni"
"Amazing home located in the exclusive Bridlegate gated community just minutes from Bandera and a short drive to Boerne, San Antonio, Helotes and Kerrville. 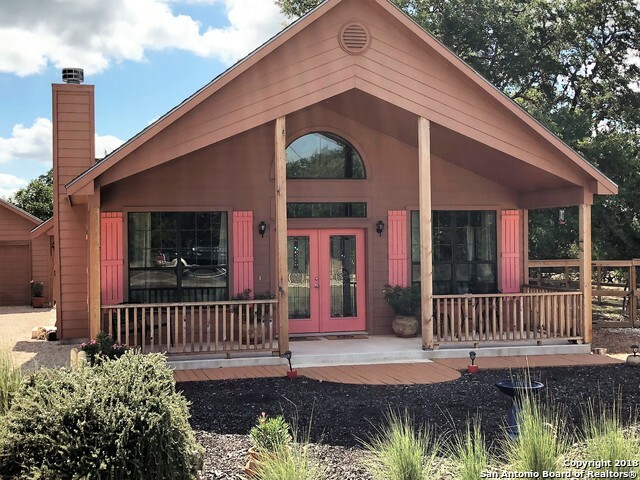 *2 acres with mature trees*circle drive*3 car garage*granite countertops in kitchen with bar*stainless appliances*master suite with shower and tub*walk-in closet*high ceilings*covered back porch and patio area. Bridlegate offers great amenities: equestrian center and riding trails, river park, swimming pools, sport courts. Welcome Home!" 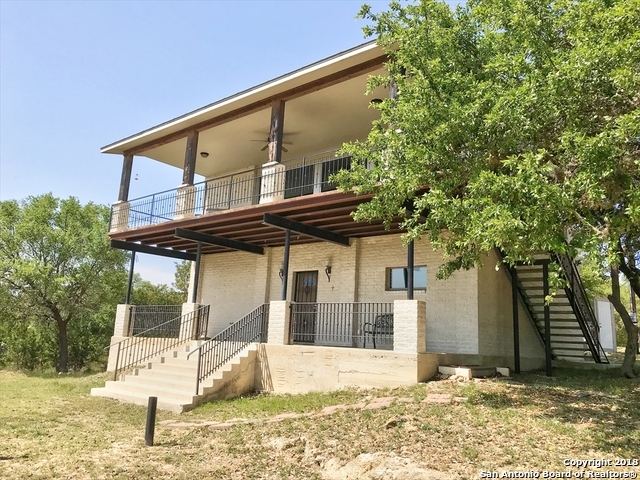 "The unrestricted property you have been looking for on 5-acres, with a private well & septic and views of the Medina River Valley. The meticulously constructed 4-bedroom home has granite counters, extra wide hallway, step-up ceilings, open kitchen/dining and stained concrete floors throughout. 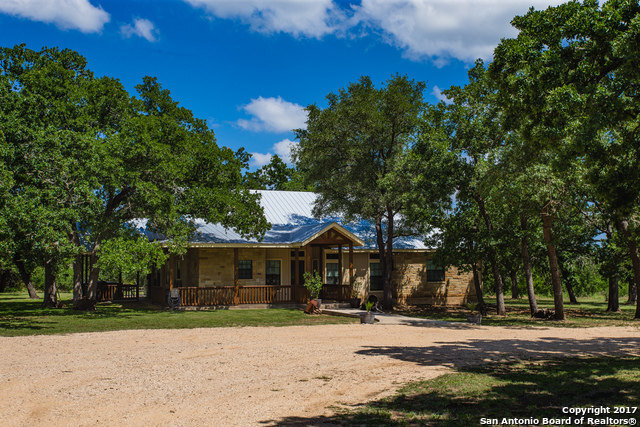 Enjoy direct access to Bandera or Kerrville, as the home is easily accessed with direct frontage along State Highway 173. The grounds are adorned with mature oak trees and wildlife abounds. Come enjoy "
"Motivated Sellers! 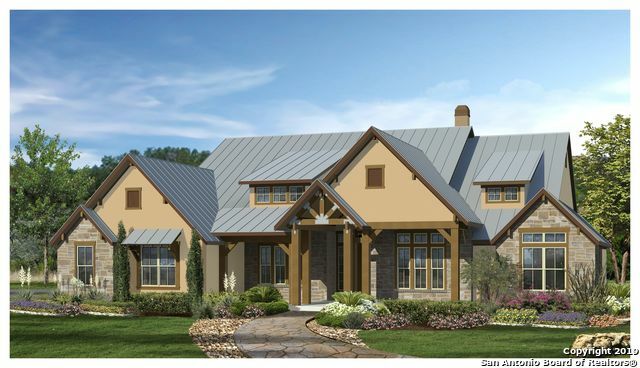 Beautiful Custom home offers expansive living area w/16' ceilings & full-wall, stone fireplace. Kitchen lends itself to entertaining w/large, granite counter/bar tops, custom cabinets, 2-sinks (both w/disposals), island & walk-in pantry. Bamboo floors in living & master, Travertine in kitchen, living, dining & bathroom, laminate in bedrooms & garage apt. (which could be 4th bedroom w/1/2 bath & 2-closets). 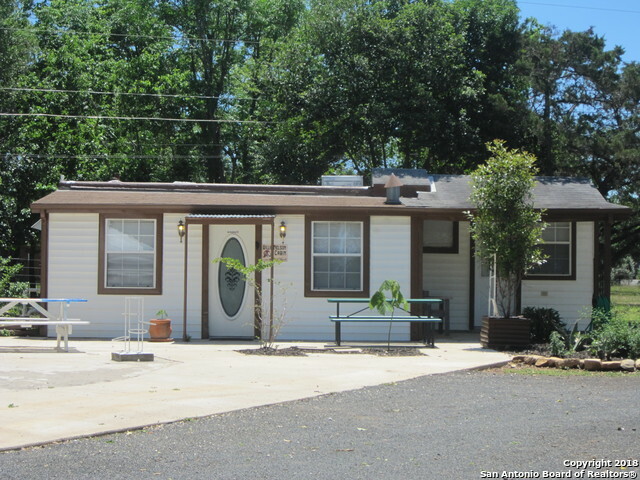 Full baths w/double vanities, master has wrap-around, walkin closet." 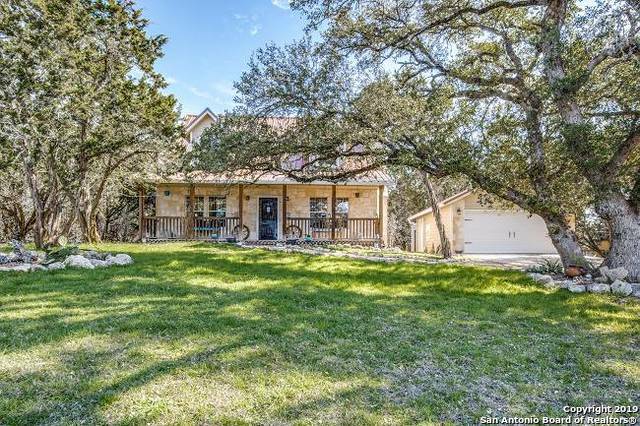 "Beautiful Hill country home nestled in quiet neighborhood, 3 BD 2 BA, granite counters in kitchen and bathrooms, huge master, covered back porch, hot tub, detached 3 car garage with unfinished loft, this property has beautiful views on 1.39 acres. Wall for potential outdoor fireplace. Easy access to San Antonio just 25 miles away." "A stunning 1 story custom rock Hill Country residence in this quiet enclave adjacent to the golf course. High ceilings, 3 spacious bedrooms, 2.5 baths, huge living room with fireplace and surround sound, study, a second office/hobby room, dining, open floor plan, gourmet kitchen with 5 burner gas stove. 3 car garage (plus undercover parking for 2 more vehicles) Also a storage room. Relax and grill on the huge covered rear patio and deck. 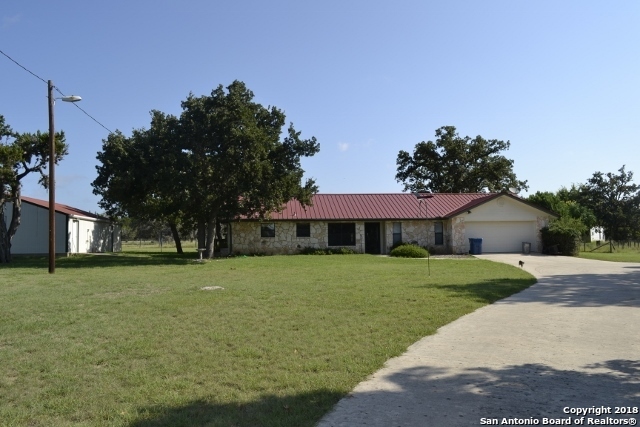 The perfect place to come home to or invite guests for a r"
"A piece of Hill Country paradise! 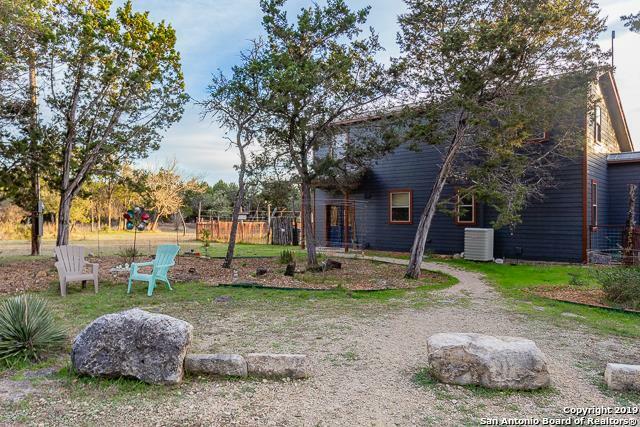 Charming Texas home on 5 beautiful acres, located minutes from Bandera and a short drive to Kerrville. Enjoy a crackling fire in your impressive native stone fireplace that soars above open living room with high ceilings. Watch the gorgeous Texas sunsets from your covered back porch or custom built viewing pavilion, perched high above the treetops! Plenty of room to stretch out, with the majority of the acreage as level, useable land. Abundant native and exotic "
"Amazing Lake-house to live full time or just enjoy the weekend away. Home is setup for amazing views from a wall of Patio doors overlooking Medina Lake. Enjoy your BBQ right outside on the covered upper patio. There is a gourmet kitchen and lots of open area upstairs to relax. Exquisite shower/tub to upstairs for a romantic evening, or a jetted relaxing tub downstairs. All Bedrooms are downstairs with laundry and walk-in closet space for bedrooms. Includes the Garage & RV Barn w 1/2 Bath, Easy "
"LOVELY 3/2/2 - ON 3 TREE COVERED LOTS AT THE END OF A CUL DE SAC FOR ULTIMATE PRIVACY. NEW AC, WATER SOFTNER, MASTER SHOWER AND RANGE. OPEN FLOOR PLAN WITH BEAUTIFUL BUILT IN BOOK SHELVES. AMAZING 36 X 30 WORKSHOP WITH BATHROOM. ALSO 4 1500 GALLON RAIN CATHCMENT WITH PUMPS. THERE'S SO MUCH THIS HOME HAS TO OFFER." "Beautifully maintained 3bed/2bath 2056 sqft home with 400 sqft bonus room settled on two tree covered lots. What a jewel! Open floor plan, stainless appliances, rock fireplace, wood laminate, custom cabinets, island kitchen, large master suite, energy efficient, double garage/shop, back yard deck great for entertaining, easy maintenance xeriscape front yard, large fenced back yard plenty of space for your RV & Boat. Recreation or residential plenty of space for family! Gated community, pool, lak"
"Spacious home in the Flying L Ranch & Golf Course, with office, sits on 5 lots. Large covered patio and deck to enjoy the wildlife views. Perfect for entertaining guests. Wood laminate and tile floors throughout, granite countertops in kitchen and bathrooms. Island kitchen with gas stove and double oven. Rear entry garage. 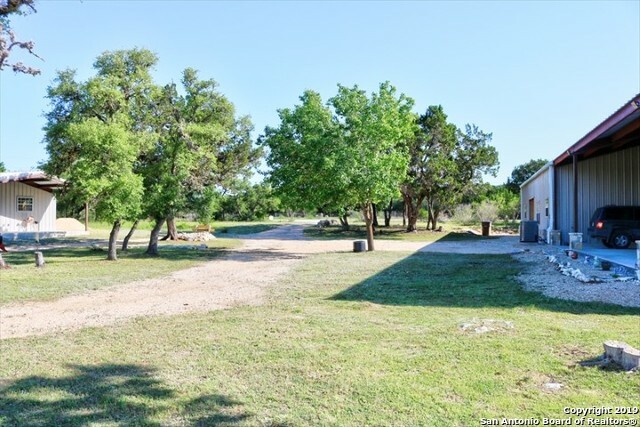 Check with Bandera County about subdividing lots to sell or build a 2nd home." "Gorgeous home in a quiet neighborhood. Great four bedroom home, three and a half bath brick home with metal roof. Updated bathrooms, new tile and carpet, new paint, new cooktop and dishwasher, A/C unit is 2015. New back porch patio! This family home is move-in ready!" 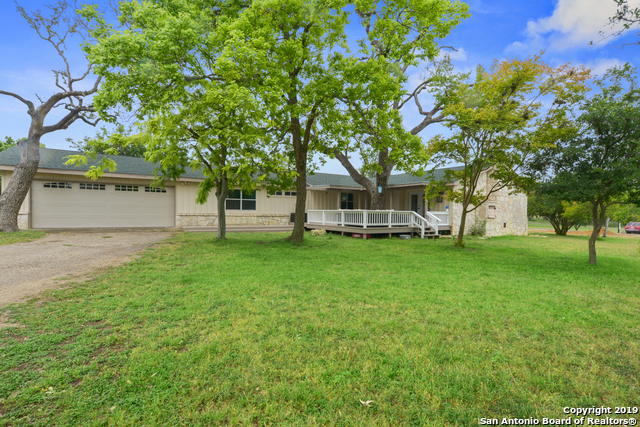 "Come see this AMAZING 1-story home on half an acre in the highly desired Bandera River Ranch!! Beautiful hardwood floors, granite counter tops, & a great open concept that offers a large living area with cozy fireplace, a study & a formal dining room. So much privacy in the oversized back yard that can be enjoyed under the covered patio. Side load 2-car garage & additional 2-car covered carport offers plenty of room to park & extra storage offered in the storage shed in backyard. Don't miss t"
"Great 3-2-2 home. New carpet and freshly painted. Rock FP (wood burning or propane) in the living room, huge dining area between the kitchen and the covered outdoor patio. Split floor plan and open living. Fenced back yard & sprinkler system. 24' x 44' shop/RV barn with (5) 220 outlets and 4 air drops. Every man's dream." "Nestled off a tranquil culdesac, this 1865 sqft country charm is ready to welcome you home. W/ granite counter tops, new flooring & a fresh coat of paint, you will find this 2/2.5 home lovingly renovated. Natural sunlight from the sliding patio doors & vaulted ceilings bring a captivating warmth to the living room. A covered porch & a chain link fence surrounding backyard will accommodate both 2 & 4 legged friends. 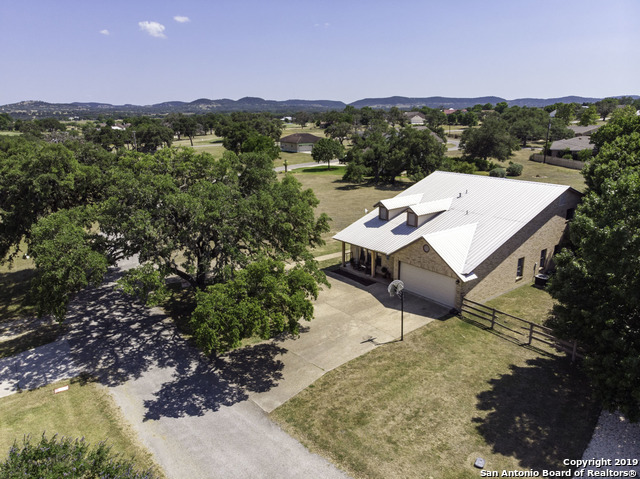 Additional attributes include private well, RV/trailer pad & a storage shed all o"
"Enjoy the Texas Hill Country in this gorgeous home with true curb appeal. Imagine relaxing on the inviting front porch and waving to neighbors. The open floor plan and abundant windows give the home a bright, airy feel and the french doors in the kitchen lead to yet, another welcoming porch. Granite countertops in the kitchen, stained concrete floors throughout the first story and the new metal roof are custom touches. The second story boasts two over-sized bedrooms and ample storage space."